I promised myself that I wouldn't do any Christmas knitting this year, and I almost stuck to it! At least six weeks ago, I offered to make my niece a hat. She chose the pattern and yarn (from a selection I offered, of course), but then asked for a flower on it. This is what's holding me up. I'm making two or three flowers, on pins. 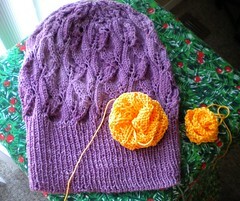 The hat and two flowers are done - except for the actual making up of the flowers. My niece is also crazy about elephants, so I thought I'd knit her one. Sigh... like the roses, the problem with the elephant is the putting together. These are most of the parts of this elephant -- 4 legs, a head/body piece, a trunk, and one ear. 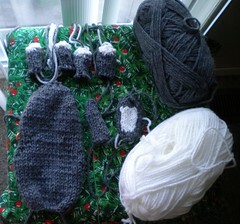 I still need to knit the second ear and the tail. I'm using Lion Brand Wool-Ease in Oxford Grey and a sparkly white they call White/Multi. I need to get these done. I'm also planning on crocheting my mom a couple of pot holders. All in all, this is very manageable. I just need to do it! When not working on these projects, I've been working on a co-worker request. I'm knitting Ysolda's Peaks Island Hood out of Manos del Uruguay Maxima. Kelly, in the next office, saw a hooded scarf on Etsy, and asked if I would knit something like it for her. Last Saturday, we went to Crazy Girl, where she chose the yarn and the colorway, neither of which would have been my first choice. 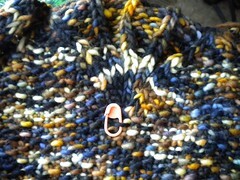 However, the yarn is amazingly squishy, and the colorway (M8881 Beehive) is working beautifully. If you check Ravelry, you'll see that some people have issues with this pattern, but I'm really enjoying it. Instead of making one end longer, to be buttoned, I'm doing both ends long, with no buttons. From the pictures, it looks like getting the button holes in the right place is hard, and Kelly thought the buttons were a little odd anyway. I need to finish up those roses and the elephant, so I can work more on this. It's cold here! Well, you have done a wonderful knitting job and geting all the requests in! The hat is going to be adorable and I can't wait to see the poject for your co-worker finished. I have all sorts of pattern books for toys, but the thought of the finishing involved keeps me from starting! The hat turned out really cute, its going to look great with those flowers. You know I must be odd, because finishing toys is the one thing I don't mind doing..I guess because its usually for a kid I figure they won't care how perfect or flawed my seams are. Of course I still have to embroider some eyes on the elephant I knit.